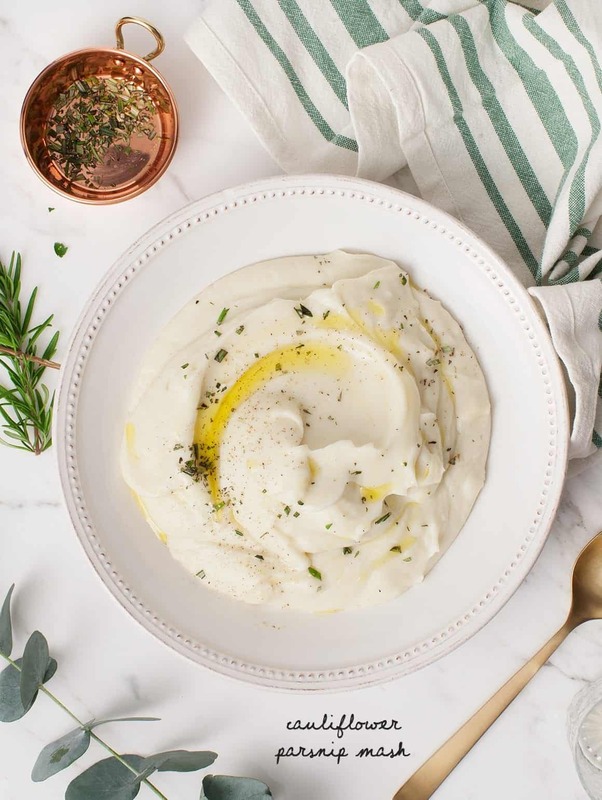 A spin on Thanksgiving mashed potatoes, this healthier dish is made of cauliflower, parsnips, roasted garlic and olive oil. Vegan, Gluten Free. Make-ahead. 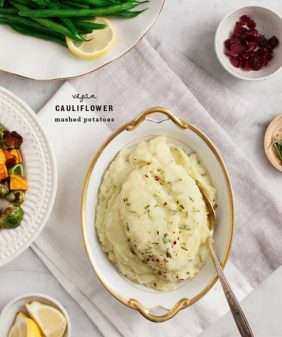 A few years ago, we made a cauliflower mashed potato recipe that was a huge hit for the holidays. Well, we’re hosting Thanksgiving this year and I decided I wanted to try something even crazier and completely take the potatoes out of the mashed potatoes. Jack considers himself a mashed potato purist, and he loved this, so I’m sure you will too. I love the nutty and complex flavors that parsnips bring. 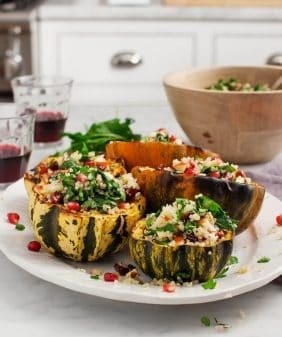 Roasted garlic and a little olive oil are all you need to give this the extra richness that will make this decidedly healthy dish taste the right amount of unhealthy. You might not fool people into thinking that they’re eating potatoes, but they’ll appreciate (or at least you’ll appreciate) that they (you) didn’t just eat a side dish with a pound of butter and a pile of sour cream. As I made this, Jack and I couldn’t stop eating by the spoonful before it made it to the table. Mashed-potato-purist approved. I should add that there’s no mashing involved – this gets made entirely in the blender, so technically it’s a puree and not a mash. It’s easier to make than mashed potatoes because there’s no vigorous mashing (or ricing) or worrying that your potatoes will be gummy or lumpy. This is best made in a powerful blender and the texture is lighter and more airy than regular potatoes (more like whipped potatoes), which I love. It reheats perfectly. Just blend it, store it in the fridge, (give it a stir) and reheat it when you’re ready to serve! Make it up to two days in advance. Roast the garlic: Preheat the oven to 375°F. Cut a ¼ to ½-inch slice off the top of the whole head of garlic to expose the cloves and place cut-side up on a sheet of aluminum foil. Drizzle with olive oil and pinches of salt and pepper and wrap in the foil. Roast for 35 to 40 minutes or until golden and tender. Ideally, keep the garlic cut-side-up in the oven. I like this tip for using a muffin pan on Simply Recipes). Bring a large pot of salted water to a boil and boil the parsnips for 10 to 12 minutes or until fork tender. Scoop into a blender. In the same water, boil the cauliflower for 10 to 12 minutes, or until fork tender, and scoop it into the blender. Add 4 to 5 cloves of the roasted garlic to the blender along with the olive oil, lemon juice, ½ teaspoon of salt, and a pinch of pepper. Blend, using the blender baton to push down the contents, and blend to a smooth consistency. If necessary, add a bit of water or broth to get the blender moving, but do so sparingly so the puree doesn’t become too thin. Taste and add the additional ½ teaspoon of salt, if desired (I did). Transfer to a serving bowl and stir in the rosemary while the mash is still warm. Add a drizzle of olive oil, more pepper, if desired, and serve hot. See make-ahead/reheating instructions in the notes below. *Once the garlic is roasted it has a sweeter, more mellow flavor than fresh raw garlic. If you use fresh raw garlic, use 2 cloves in this recipe (not 4 to 5) and let it boil in the water for a few minutes with the cauliflower to take out the raw bitter taste. I highly recommend sticking with the roasted garlic for this recipe. This recipe reheats very well - the flavors become more integrated and delicious the next day. Store for up to 3 days in the fridge. Reheat in the oven or microwave and stir before transferring to a serving dish. I will make this soon! These look fantastic! I always love using cauliflower as a disguise for a rich sauce. The addition of parsnips is really clever. Can’t wait to try these out! 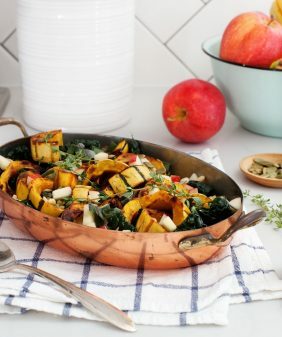 Great side dish for the holidays! I’ve tried a version like this too. But with carrot/parsnip/potoato. It’s amazing, I agree. Glad Jack approved, that purist haha! Yummy! 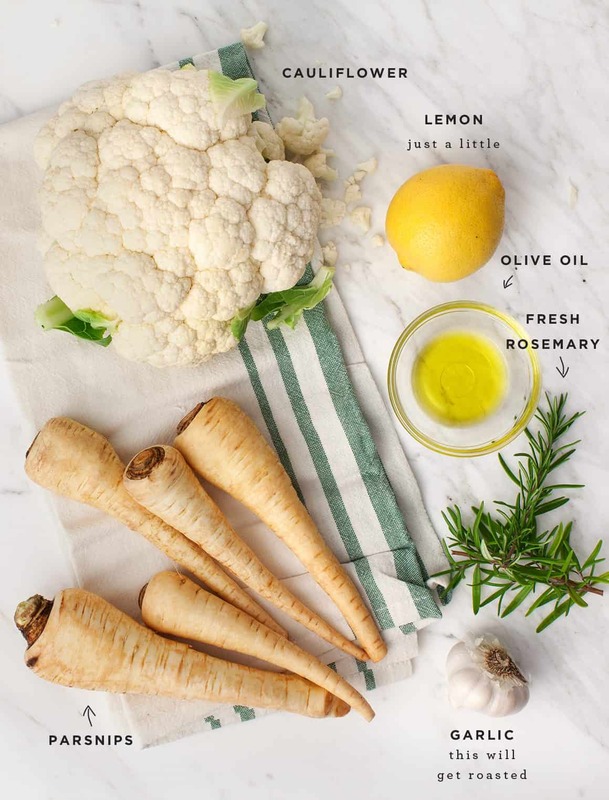 I love parsnips and I know these taste amazing!! wow!! It looks so Good and Easy to make! I will try this but one thing is can I use carrot without using parsnips! Maybe parsnips are not available here. Let me know!! 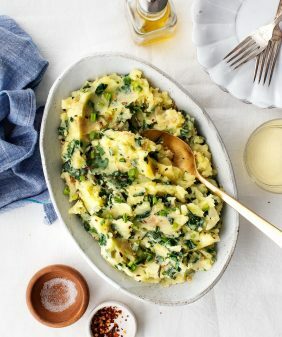 Loving this mashed potatoes alternative! Is it possible that this dish is too pretty to eat?! This is so going on my table this year! This looks so delicious, Jeanine. What do you think re. roasting the cauliflower and the parnips along with the garlic? Those are my two favorite vegs to roast. I’d love your input. Thanks Karen! I’ve tried that and it didn’t work well for me. 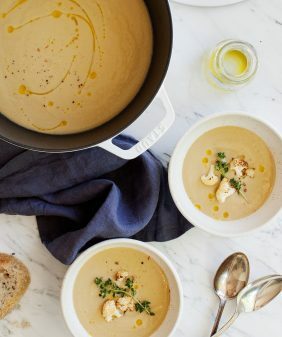 Since much of the moisture roasts out, more liquid in the blender is required – which works great for soups but I couldn’t get (specifically the cauliflower) to whip into an airy texture that I think is necessary for the mashed-potato-like texture. I’ve just had much more luck lightly boiling it for this type of recipe. Hope that helps! Ah…that makes sense. I had a feeling you might have tried it. Many thanks for the speedy reply! Would a food processor work for this recipe or do you need a blender to get the correct consistency? I don’t think a food processor would whip it into as creamy of a texture. Although I haven’t tried – I’d just be worried that the parsnips might end up a bit chunky. Food processor works great! 🙂 Took a little while…but keep committed and you’ll get there! This is delcious! Tastes very similar to mashed potatoes and the texture is spot on! I brought it to a friendsgiving and everyone loved it!! Hi Laurel – I’m so glad everyone loved it! Just got done making this for ourTthanksgiving meal. I could not stop eating it by the spoonful before it hit the table. This recipe is so easy and delicious, I will definitely be making this time and time again! Hi Stephanie – I’m so happy to hear that! (that’s how I felt, spoonful after spoonful). Glad this one was a hit! This was fantastic! 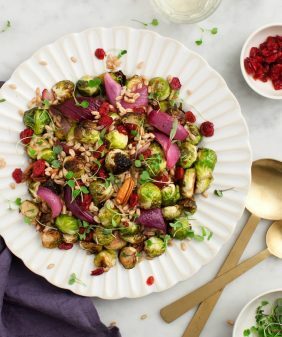 Just made it with a side of crispy roasted Brussels sprouts and it tasted amazing and just like mashed potatoes – maybe even better! Hi Emma, I think the texture might change, so I wouldn’t recommend it. Wow! I made this second time around and steamed veggies instead of boiling and it turned out even better! One of my most favorite recipes! Thank you so much for sharing! It’s light, fluffy, so flavorful and seriously addicting!!! This recipe is delicious, the mash is so flavorful. I love it and it was very easy to make. Hi Mary, I’m so glad you enjoyed it!